While vacationing at Disney World we celebrated our tenth wedding anniversary. We didn't really plan it that way. Valentine's Day just happened to fall in the middle of Mardi Gras week! Has it really been ten years? A decade sounds so long, but the years have passed so fast! 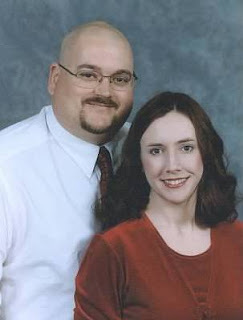 How young we look! We both definitely had less gray hair back then. We had no idea what was in store for us. Young, in love, and ready to start a life together. We have had our share of ups and downs along with the good and bad. There has been lots of laughter along with tears. AND after all that he still puts up with me!! Too often we are caught up in day-to-day life to really appreciate each other. Work, kids, crying/fighting kids, housework, yard work, errands etc... Always something that needs to be done or some place to go. 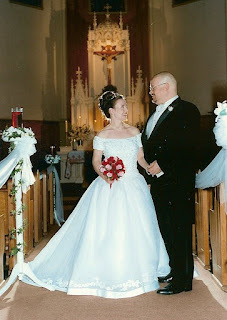 Ten years is a long time and we do tend to get stuck in a routine. No matter how busy we are though, Clint makes sure to always tell me he loves me. No matter how long of a day he has had, he walks in with a smile and a hug for me. I'm a lucky girl. I can't wait to see what the next decade brings us! I always wondered just how to be chosen as the Family of The Day to open the Magic Kingdom. We've watched countless videos of the "good morning people," as the kids call them. And wondered how exciting would it be to ride in on the train with the characters and open the park with the Mayor of Main Street!!! Apparently the best way is to get there very early. Be very lucky. Get there very, VERY early and be VERY very lucky. None of which we were. We watched the opening and began the trek down Main Street. 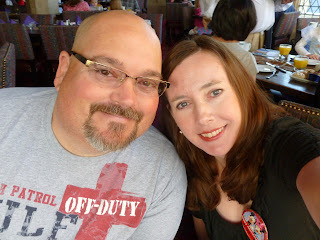 First stop was Town Hall to grab our Happy Anniversary pins. Stopped to take a photo with the Mayor. 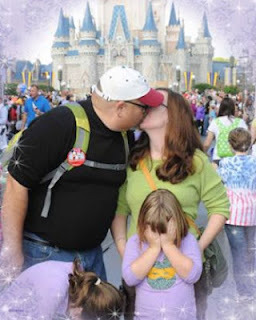 We stopped to grab a photopass or two (darn crane was still over the castle.) 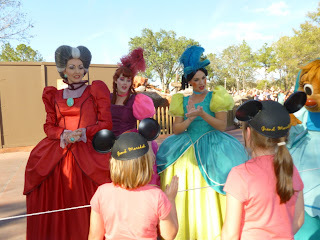 Out of no where a Cast Member approached us. I'm walking along and he keeps asking where we were from, were we going to be at the Magic Kingdom all day, etc. The whole time I have one goal in mind: get to Fantasyland. And I will admit thinking this guy is delaying us with his questions!!! "Would you be interested in doing something special?" Ok, I stopped wondering what bit of Disney Magic he was going to dish out. And he said he wasn't selling anything and there was no catch. 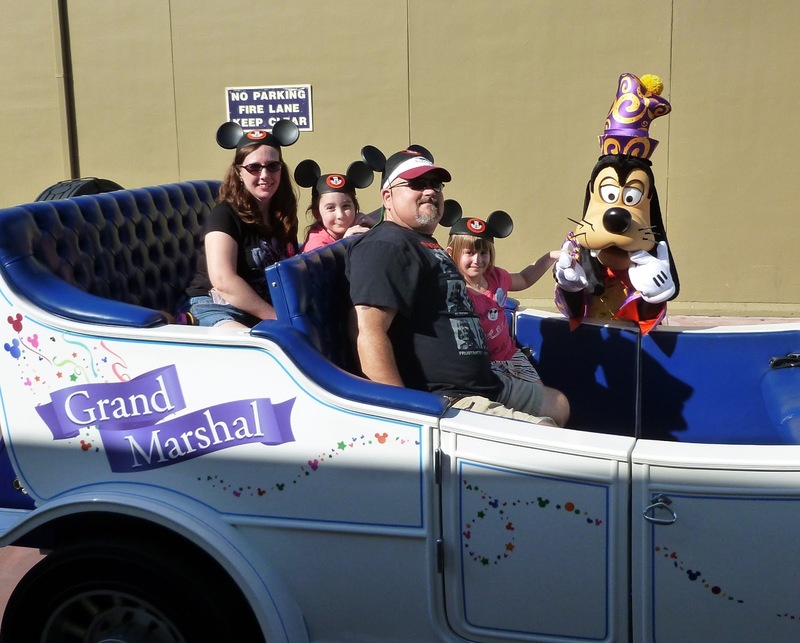 He was to pick a family to be the Grand Marshals of the 3:00 parade. And he had picked us. Wow, wow, wow!! We got to not only ride in the parade but lead the parade!! We met him at the parade's beginning 20 minutes before 3:00. 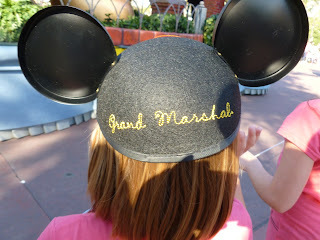 He gave us Mickey Ears that had "Grand Marshal" embroidered on the back. We were led to a convertible back stage to wait. Minutes before the start of the parade, over the loudspeaker it was announced to please welcome"The Galliano Family from Houma, LA as the Grand Marshals of the parade!" A photopass photographer was assigned to us and he popped up through out the route to snap pics for us. We waved and smiled and were greeted with "LSU" and "GO HOUMA" cheers through out the streets. At the end, we hopped out of the car and there was a special spot roped off just for us to watch the parade. All the characters stopped as they passed by! Truly a magical moment that we will never forget. So how do you get to be Grand Marshal of the Magic Kingdom parade? Luck, pure luck. And a whole lot of Disney Magic.